Last week VMware officially launched VMware Horizon App Manager, the first phase of their "Horizon" project which extends on-premise user identities and app provisioning into cloud and SaaS apps. 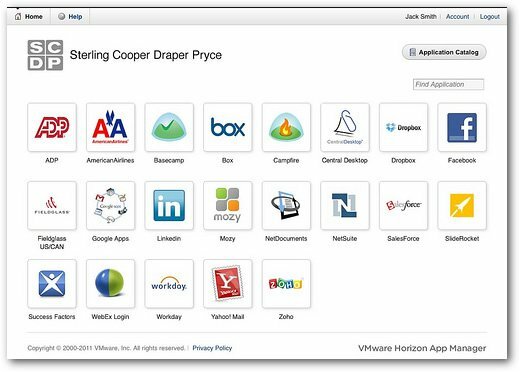 Last week VMware officially launched VMware Horizon App Manager, the first phase of their "Horizon" project which extends on-premise user identities and app provisioning into cloud and SaaS apps. This is definitely a "v1" launch (well actually the stuff is labeled "v2" for some reason), and there's a long way to go before the products fulfill VMware's full vision, but it's exciting to see some real stuff here that we can finally get our hands on. In most current environments, companies use something like Active Directory for internal app authentication. (Both for Windows apps and a lot of in-house web apps.) But when it comes to external web-based SaaS apps on the public internet from third party companies, integration with the internal AD is often complex, so most companies just don't do it. This means that users have one username and password for their internal AD, plus another username and password for each external service they use. Do you know how was I able to crank out such a complete list of websites I use? I just checked the "passwords.txt" file which lives on my laptop that keeps track of all these things, because they all have different password complexity requirements, expiration dates, and password reuse policies. This isn't secure, since I have to write down all my passwords. Getting me setup in all of these systems was probably ten hours worth of helpdesk tickets, admin work, emails, and phone calls. The ultimate vision is that "checking the box" for the user can do the full provisioning at the SaaS/web/cloud provider too, based on his or her internal user account. The unfortunate reality of today's world, however, is that of the thousands (millions?) of web apps out there, only a few actually offer provisioning & de-provisioning APIs, so today's version of Horizon App Manager can only actually do the full automatic provisioning & de-provisioning for big SaaS apps like Google, Box, Salesforce, etc. That said, today's Horizon can still be used for single sign-on for all those "other" web apps out there. If the web apps support one of the federated authentication standards, like SAML or, Oauth, Horizon App Manager can handle the authentication in a federated way. (In this case, though, the user must already have the account setup and provisioned on the service which is then hooked into Horizon. This web portal will reconfigure itself based on the device that it's being access from. (1) First and foremost, more and more cloud/SaaS/web apps will create provisioning APIs (which VMware will integrate, not us! ), and more will use federated authentication so we can do "real" SSO instead of that password stuffing. So while that might be a slow march that takes years to shake out, every month will be better than the last. And VMware will continue to release more password-stuffing browser plug-ins, so we should meet in the middle somewhere fairly soon. (2) We'll also see platform-native Horizon clients that have full integration to native apps and the full device experience. For example, a native Windows Horizon App Manager client could put icons to Horizon apps in the Start Menu or on the desktop of a Windows user. This would essentially be exactly like Citrix Program Neighborhood Agent / Citrix Applications plug-in except that it would hook into Horizon for external web apps instead of the Citrix server. (4) VMware also explained that they'll extend Horizon App Manager to Windows apps. For example, they could hook into seamless published Windows apps from Citrix XenApp, Quest vWorkspace, or Microsoft RemoteApp. Essentially the Horizon infrastructure would replace the native web interface or agent-based clients for these platforms--but they'd still connect through those platforms' native brokers, clients, and protocols. (And I assume that Citrix/Quest/Microsoft would be fine with this, since they're still getting paid and they're still managing the app delivery experience.) This means that the single Horizon App Manager app catalog could be the single "go to" place for both Windows and web apps to any platform and any device. (6) VMware is also talking about integrating ThinApp-based Windows native apps into Horizon App Manager. This is a great idea, although to be honest I'm not 100% sure how that would work. Right now ThinApp doesn't really have any kind of central catalog of which apps are available to which users. So I'm assuming with Horizon App Manager would become that catalog, and that you'd import all your ThinApp packages into it and they'd just appear as checkboxes in the Horizon admin that you can tick for different users (or that users can tick for themselves). Then perhaps the platform-native Horizon App Manager client would also be able to check to see if a particular ThinApp package is available locally, and if not, it could download it. In fact I'd love to see some intelligence that could link ThinApp packages which run locally with remote seamless apps (so users could run it locally if possible, and if not they could launch it remotely, like the old SoftGrid ZeroTouch). (7) Looking even further out, I'd love Horizon to somehow integrate with whatever today's user virtualization products evolve to become. While it's nice that VMware bought RTO Virtual Profiles last year, that's a true Windows-based profile optimization tool. It doesn't have the capability--nor have I heard any hint that VMware wants to build the capability--to extend it to manage user settings across multiple device types and multiple OSes. So maybe Horizon can integrate with whatever AppSense/RES/triCerat/Sense evolve to become over the next few years? As I've written before, I love the Horizon App Manager concept and I absolutely believe this is the proper direction for the future. I've written a bit about how the Windows desktop will evolve (or devolve?) over the next few years, and being able to manage a "desktop" as nothing more than a collection of apps and data will be critical. I love that VMware is going down this path. And I *really* love that VMware is integrating with the Windows remote app publishers like Citrix/Microsoft/Quest/etc. for WIndows apps rather than going out and trying to build it on their own or buying someone like Ericom. Let those experts work on those products and let VMware be the central aggregation point for all apps across all platforms. Really good article, will you also take a deeper look into Citrix Open Cloud Access and maybe do a comparison between Citrix Open Cloud Access and VMware Horizon at some point? My first thought regarding Citrix Open Cloud Access is of course the price and the requeriments surrounding NetScaler etc. But it would be nice to have a comparison between the two products regarding what features/functions etc. they can provide or if they are just the same. http://keepass.info to name just one brilliant, free multi-platform password manager. Iâve anecdotally heard of identity theft but never envisioned myself as a target. please remove the account @KimmoJ that is impersonating me. Yeah right, there is only one person in the world with the name Kimmo and a last name that starts with J. Though I hadn't noticed there was one here, only found the site a month or so back. Go figure. But I can actually prove that my name is Kimmo J if called upon to do so by Gabe or Brian.